As specialists in distance and position measurement technology, eddylab GmbH would like to use this website to provide you information for a better understanding of inductive sensors (LVDT) and tell you about the possibilities and benefits offered by our position transducers. This will help you as a customer to find the perfect sensor for the task. We also intend to give you a better understanding of the basic principles and characteristic features of this type of sensor. A LVDT (linear variable differential transformer) is an analogue sensor for measuring displacement. Inside the sensor there is a coil system consisting of a primary winding and two secondary windings, which converts the linear displacement into an electronic signal. The electronics, or “carrier frequency measuring amplifier”, supplies the primary coil with an alternating current. 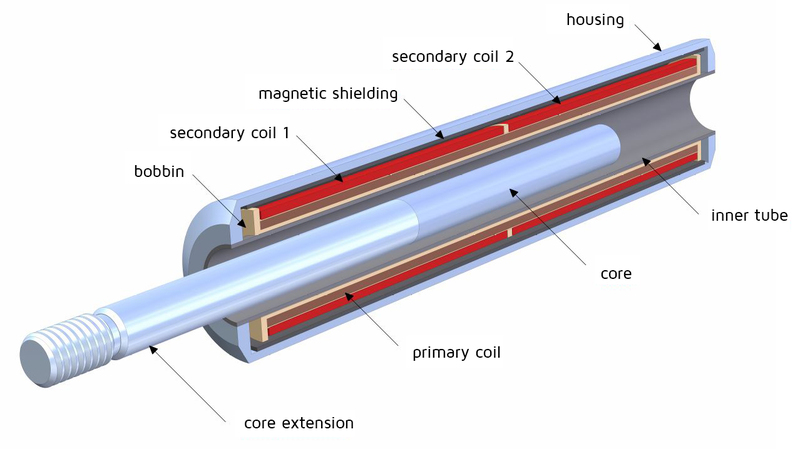 A ferromagnetic core, which is located inside the cylindrical coils and is generally connected to the object being measured, induces a voltage in the secondary coils (Usec). When the core is positioned in the middle, the voltages of secondary coil 1 and secondary coil 2 are equal. If the core is moved out of the centre, the voltage rises in one coil and decreases in the other coil (see diagram). The ratio of these voltages is analysed differentially by the electronics and is usually converted into a standard output signal (0...10 V, 4...20 mA, etc.). LVDT sensors have an excellent linearity within the specified measuring range. It is often possible to increase the measuring range if greater linearity deviation is allowed. The ferromagnetic core has an internal thread, to which a so-called “core extension” made from anti-magnetic material is fitted. Generally, the push rod is attached to the moving object and functions without touching the sensor. Alternatively, an LVDT may also be equipped with a push rod guided by plain bearings. The most popular design, is a spring loaded mechanism like a probe indicator. This sensor type is particularly suitable for measuring tasks, that do not permit modifications at the targeted object (i.e.threads). The outer casing, which is made from high-grade stainless steel or chromium-plated steel, also acts as a magnetic shield, protecting against external interference. In addition, the coil system can be wrapped into a special shielding foil. 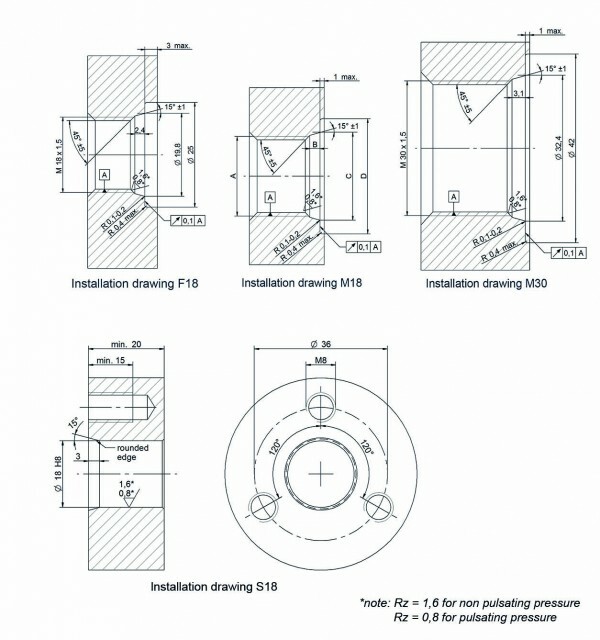 Different primary and secondary winding designs can be designed according to customers’ needs. The figure below shows a long coil with layer winding, which guarantees excellent linearity. Other winding techniques sometimes result in a simpler structure which brings benefits when manufacturing, or may offer a better ratio between coil length and measuring range. 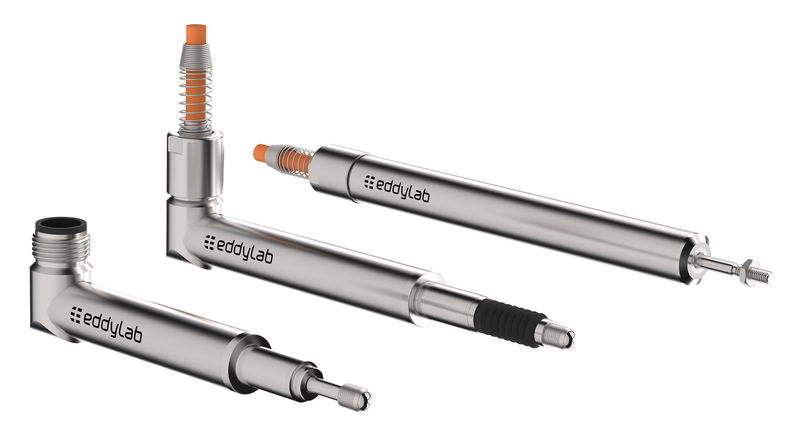 All of eddylab’s inductive sensors are built with a full bridge design. This has great benefits according to temperature behaviour (low temperature coefficient) and makes the measuring system resistant to external interference (EMC). Ideally, eddylab LDVTs should be operated with eddylab electronics - also known as carrier frequency measuring amplifiers. This ensures excellent performance and minimizes the installation effort. Of course, our LVDT´s can also be driven by third-party electronic systems. Our sensors are very robust, making them suitable for applications at high temperature and extreme vibration. 230 °C are available optionally. subsequent adjustment of zero point and gain to suit the application, for example to compensate for installation tolerance. a shorter sensor design, as there is no room needed for a circuit board. a wider range of functions: adjustable carrier frequency settings, phase shift compensation, variation of the filter structure and output signal (4...20 mA, 0...20 mA, 0...10 V, 0...5 V, 0,5...4,5 V, ±5 V, ±10 V), cable break detection etc. Measuring amplifiers that are integrated into the sensor casing have a simpler design. They offer the benefit of having an “all-in-one” solution and offer the analogue signal directly. Due to the wide variety of LVDT designs available, these devices can be used for almost any application. They are well-suited for quality control under laboratory conditions. In various machinery, they are used for real-time production monitoring. Their ability to withstand electrical interference, extreme temperatures, thermal shocks and vibrations makes them suitable for any demanding application in industry. High IP ratings and high-quality casing materials such as stainless steel and titanium guarantee long-term operation underwater. These position transducers also withstand aggressive chemical environments, e.g. cleaning chemicals or disinfectants used in machines for food production or in packaging machines. 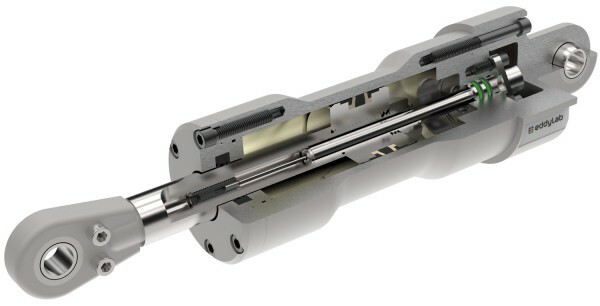 Pressure-tight versions are installed in hydraulic cylinders, servo valves and pneumatic cylinders where they are used for process control and monitoring. The differential measuring principle “filters out” faults (differential inductor). The absolute measuring principle used by these sensors gives them an advantage over incremental position transducers. The sensor position is always defined, even if the current supply fails. It is not necessary to set a reference mark to determine the absolute position. The non-contact measuring principle, which means there is no contact between the coil and core, is “wear-free”. As a result, the design with a free-moving push rod has a theoretically unlimited mechanical service life. 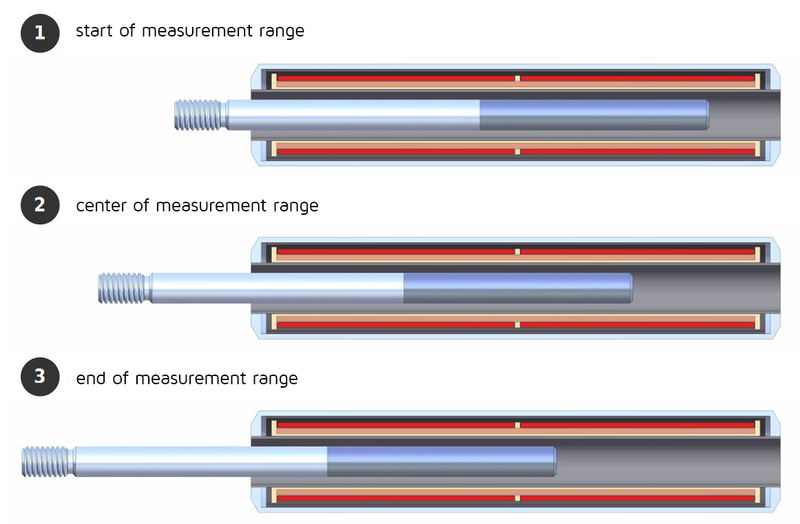 Contact measuring sensors such as linear potentiometers do not fulfil this condition. Continuous contact between the wiper and conductive path significantly reduces service life. LVDTs have a low linearity deviation. Typically, 0.2 ... 0.3 % of the measuring range. Of course, these values can be reduced even further if desired. No mechanical friction is produced within the sensor if an unguided push rod is used. Here, the resolution is theoretically infinitely fine. It is only limited by the noise performance of the measuring circuit (primarily the electronics). Inductive sensors only react when the core is axially displaced. Radial misalignment of the push rod, which can occur if it is installed off-centre does not influence the output signal. 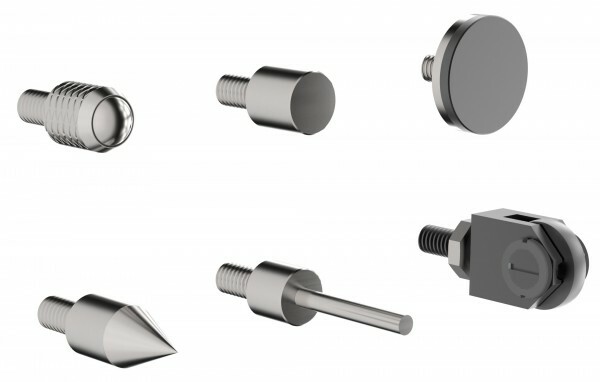 The new SL-T sensors offer a robust spring-loaded version: equipped with precision bearing and a return spring the SL-T is suitable for measuring tasks, that do not permit modifications at the targeted object. The combination of a hard-chromed push rod with 6mm in diameter and a precision bearing in stainless-steel-housing with 20mm in diameter guarantees highest resistance to lateral acted forces. Offering a large measuring range, coupled with three functions variants the SL-T series enables diverse areas of applications: For the variants with spring loaded mechanism, the push rod extends by an integrated draw spring. 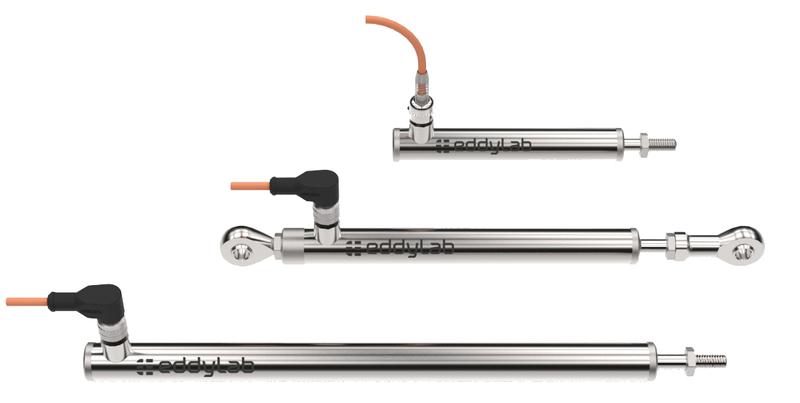 For automated measurements eddylab has developed two air driven versions. By applying air pressure, the push rod moves in or out, depending on the customer´s needs and application. 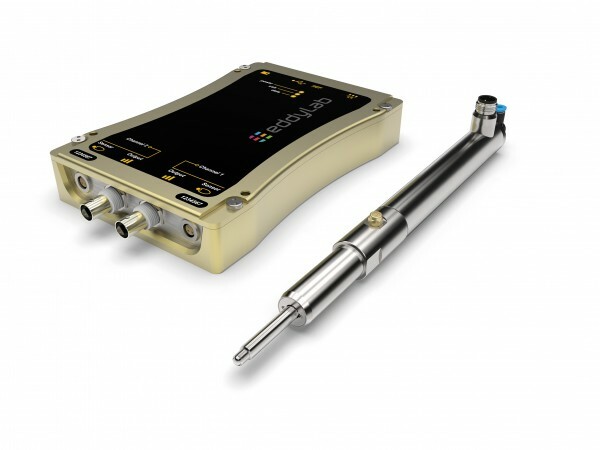 The LVDT digital controller from eddylab, to which either one or two sensors can be connected, now considerably improves the linearity of inductive displacement transducers. The digital controller conditions, digitizes and linearizes the sensor signal and outputs it as a voltage or current signal as well as via CAN bus or USB interface. The readings of the LVDT digital controller can be visualized and configured using the analysis software specially developed by eddylab. The sensor, cable and electrical system together constitute a measuring instrument with a traceable calibration. Please note that any modifications at the cable or the electronics invalidate this calibration. Please refer to the calibration certificate for the correct combination of sensor and electronics. The asignment is given with the serial numbers and is documented in each calibration certificate. Do interchange electronics and sensors. If you wish to shorten or extend the cable between sensor and electronics, you need to readjust the electronics. As a general rule, only shielded cables may be used and the cablelength should be as short as possible in order to minimise external noise. When installing the cable, make sure it is mechanically protected. Avoid running the cable over objects with sharp edges. Damped camples cause noisy signals and may take up liquids. Avoid exposing the cable to tensile or torsional stress. Core extensions (type: free core) must not be made out of ferromagnetic material. Aluminium and brass cannot be used either. We recommend that you use austenitic stainless steel (1.4301, 1.4571) or titanium. Please note that machining may cause some metals, such as 1.4305, to produce residual magnetism, which may affect the measurement result. Plastics are suitable in theory, but often aren’t strong enough or have a high thermal expansion coefficient. Protect the electronics from humidity. Do not attempt to disassemble the sensor. This voids the warranty – your sensor will be damaged. The sensors are not suitable for high radiation environments (nuclear power stations). Please contact us for radiation resistent sensors. SM series sensors are clamped on the outer housing. When a flange clamp (see SM series accessories) is used, the sensor may be displaced in the axial direction. This facilitates the installation of the sensors. Robust housing admits almost any other kind of mounting. The SM spring type LVDTs can also be clamped on the 8 mm diameters at the front of the senors. When mounting a push rod with male thread, please use a thread locker (e.g. Loctite 243) or the lock nut supplied. 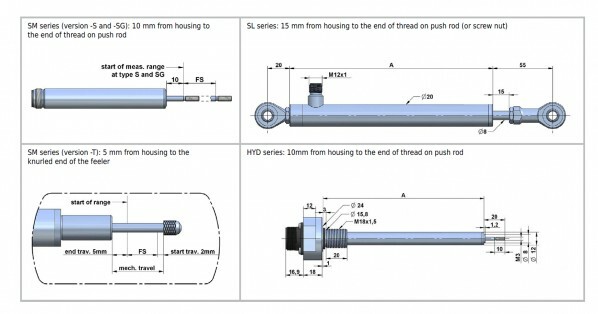 The installation instructions of the SM series also apply for the sensors of the SL series. We recommend to use bolts with a tolerance of ø8 g7 as a counterpart to devices with rod end bearings. The rod end bearings do not need any lubrication or maintance. 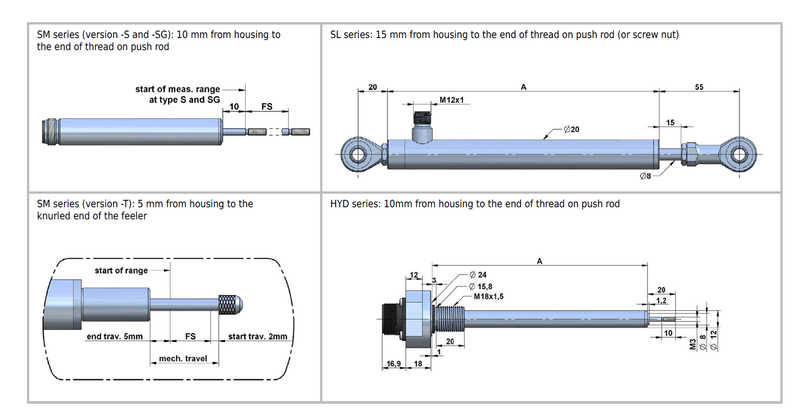 For devices of the HYD and F18 series the screw flange of the counterpart must be designed in accordance with DIN ISO 6149 to ensure pressure tightness. The IMCA external electronics is designed to be mounted on DIN-rails in a switch cabinet. Therefore, choose a dry location, preferably with a constant temperature for the electrical installation. Please make sure the supply voltage is correctly connected to the device. Accidentally connecting the supply voltage to the signal output damage the device. Connect all cables before power up. As basic rule, always try to seperate power paths form signal paths. Do not align the supply of converters, drivers or generators with the LVDT signals. Please use shielded cables and connect the shield only on one side to avoid ground loops. 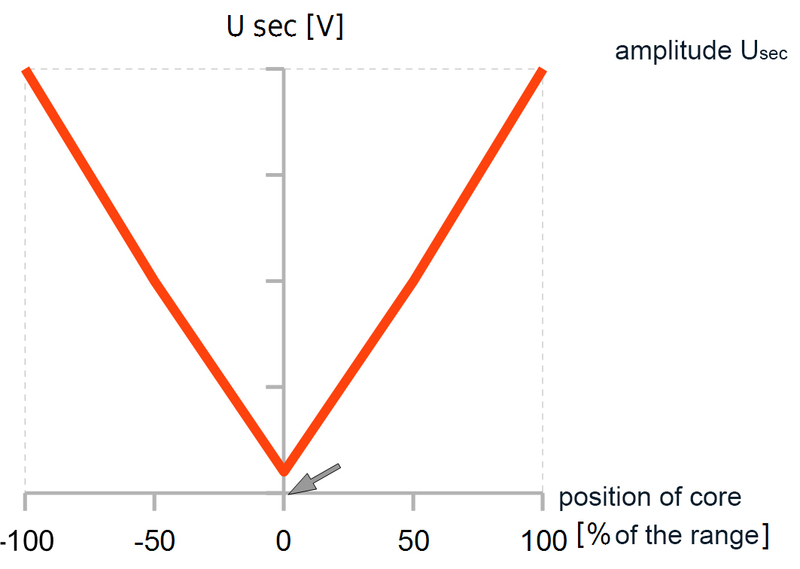 An LVDT generates an alternating voltage signal (Usec) at its secondary coils. The amplitude at this signal depends on the position of the core. This signal drops to almost zero in the centre of the measuring range and increases if the push rod is moved away from the central position. The electronics converts this signal into a linear analogue output signal. 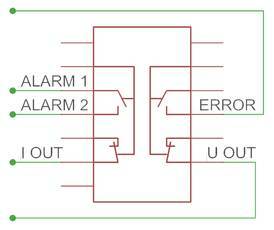 In case of a cable break between the sensor and the electronics, there is no signal at the electronics input. . With conventional devices this signal state will cause an undefined output signal. This undefinded singal may not be processed in the control system at your machine. The signal output is deactivated. There is no current or voltage signal. The red ERROR LED flashes. The red ERROR LED is on. eddylab GmbH guarantees maximum accurancy. Nevertheless – the zeropoint may vary due to slight tolerances at the coils. Please follow the directions contained in the diagrams to find the start of the sensor’s measuring range. Please note that the zero point and gain have to be adjusted if the cablelength between sensor and electronics is varied. 2. Adjust the offset with the ZERO potentiometer, set the output signal to 4.000 mA (for 4...20 mA) or 0.000 V (for 0...10 V). 4. Adjust the gain with the GAIN potentiometer, set the output signal to 20.000 mA or 10.000 V.
Output signal ±5 V, ±10 V: Move the push rod to the centre of the measurement range (SM25-T: 17.5 mm, SL100-G: 65 mm). Set the offset to 0.000 V. Move the push rod to both end positions and prove the signals (e.g. -10.035 V and +10.035 V). If this is not the case, correct the values with the ZERO potentiometer. Finally, set the gain to 5.000 V (-5.000 V) or 10.000 V (-10.000 V). Inversion of signal direction: If an inverted output signal is required (20...4 mA/ 10...0 V/ 5...0 V), interchange clamps 6 and 8 (secondary coil) on the external electronics. 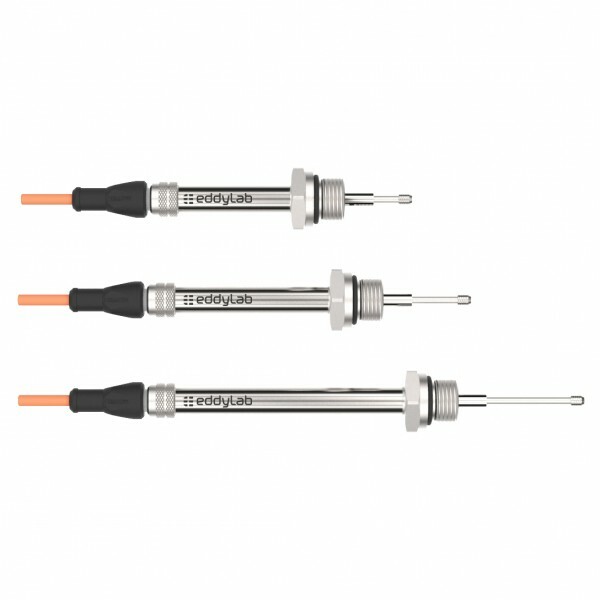 eddylab offers a comprehensive range of accessories for inductive sensors, such as cables, mounting accessories, field-attachable connectors, displays, etc. We emphasize the various choice of feelers for gauges of the SM series. Different types, shapes and materials are available, to adapt the sensor to the application.